It may seem an unlikely pairing, but I would like to make some comments on and comparisons between two seemingly disparate literary heroines, Anne Elliot and Lucy Manette. In Charles Dickens novel, A Tale of Two Cities, the beautiful Lucy Manette marries Charles Darnay, the descendant of an aristocratic French family denounced by the revolutionaries, among whom are the memorably evil fanatic Mme. Defarge. While in Jane Austen's last novel, Persuasion, whi ch was not published until after her death, Austen created a strong, mature, and independent heroine, Anne Elliot. Having foolishly broken off an engagement eight years earlier to Frederick Wentworth, a penniless naval officer, Anne at the age of 27 has remained unmarried--and secretly devoted to Wentworth. While written decades apart and depicting two different women, one of whom is substantially more "mature" than the other, I believe these characters share some of the same core values, the foremost of which is an enduring love for a man in whom each believes strongly. Lucy, as wife to Charles, is able to withstand the separation from him while he is imprisoned awaiting apparent doom buoyed by her love for him. Anne, after being "persuaded" to break off her engagement to Frederick when she was all of nineteen years old, did not abandon her inner feelings for him and found that in nurturing this enduring love she could attain the reward that she may not have imagined possible when he went off to sea. In addition to and complementing their love each woman demonstrates an extraordinary loyalty to her friends and family. We see this demonstrated in Anne's relationship with Mrs. Smith just as Lucy demonstrates a loyalty to her Father during moments when she cannot be sure that he recognizes her. My comparison would not be complete if I did not also note some of the contrasts between the heroines and their respective novelistic worlds. There could not be a greater distance between the settings of the novels than these two with one focused primarily on two houses within miles of each other in England while the other is focused, as the title makes clear, on two urban centers in two different countries separated by the English Channel. One is focused on the internal workings of families seemingly immune to the world outside them while the other finds the characters and families buffeted by the winds of revolution and the politics of their respective countries. Fate and death intervene in the world created by Dickens with the express intent to mirror history; while fate is also present for Austen, and the threat of death is not absent, it is not nearly so overwhelmingly displayed. While the two heroines seem to share a certain reserve, it is in Austen's novel with its' narrower focus on family and marriage that we learn more about the details of the heroine's life. In many respects Lucy remains a cypher, not unlike some of Dicken's other fictional women, perhaps in part because, unlike Esther Summerson in Bleak House, we never are allowed to share her thoughts. In spite of the differences I believe that the fundamental character of each of these women has much in common. From my recent reading of these two novels they will remain among my fondest memories. 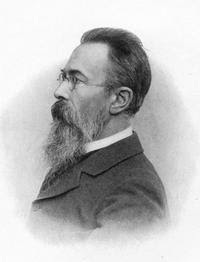 Nikolai Rimsky-Korsakov composed the Russian Easter Overture in 1888 and conducted the first performance in December of that year. Last night I attended a performance by the Chicago Symphony Orchestra led by guest conductor Charles Dutoit. I was surprised to discover, upon reading the program notes, that it had not been performed on a subscription concert since 1951. This is among Rimsky-Korsakov's most popular works and its absence from Orchestra hall for more than a half century is inexplicable. Fortunately it has returned and the audience was treated to the stunning orchestration of Rimsky-Korsakov who was at the height of his powers when he wrote this piece, following Capriccio Espagnole and Sheherazade which had premiered earlier in the same year. Under Dutoit's baton each section of the orchestra displayed the virtuosity that is the hallmark of the Chicago Symphony Orchestra. The concert also included the Symphony in C of Igor Stravinsky, a twentieth century neoclassical icon completed in 1940 specifically for the fiftieth anniversary of the orchestra, and the Brahm's First Piano Concerto performed by the virtuoso Russian pianist Yevgeny Kissin. Each work was performed brilliantly by the orchestra while Kissin's mastery of the difficult Brahms concerto was the high point of the evening. This was certainly one of the best concerts that I have had the pleasure to attend this season. Reading literature about a particular city gives you insight into the mores and character of that community. This is true of Alaa Al Aswany's novel from 2002, The Yacoubian Building (ImaratYa'qubyan). I found the novel both well written and structured. Using the title building as his center Aswany portrays a diverse group of contemporary Cairenes to demonstrate the experience of living in the world of Egypt today. The author presents the issues of political corruption, class conflict and the "science" of love in a believable narrative; however, I found his portrayal of homosexuality less effective: sensitive at times but ultimately concluding with a stereotypically brutal end for the spurned lover. The difficulties of living in this society are highlighted as the novel moves smoothly from episode to episode building toward a climax that, while somewhat melodramatic, brings the story to an effective conclusion. Overall the complex narrative and view of the city of Cairo made this an engaging and satisfying read. The Yacoubian Building by Alaa Al Aswany. Harper Perennial, New York. 2006 (2002). Lucette Lagnado's moving memoir is subtitled My Family's Exodus from Old Cairo to the New World. It is a story of a remarkable father and his family movingly told with the feel of a novel as you share the experiences of this family who traveled half way around the world to settle in America. Lucette Lagnado, who is a senior special writer and investigative reporter for The Wall Street Journal, demonstrates both her skill as a writer and an investigator. The story begins with the marriage of her parents, Leon and Edith, in wartime Cairo. As the family establishes itself after the war, the position of the Jewish community gradually deteriorates until, in the early sixties they flee to Paris en route to their eventual destination. The strength of both parents and the details of the family's difficult journey is a story that this reader found intensely moving. The thought of being "stateless", as they were once they left Egypt, is hard to imagine. That they overcame this and survived is a tribute to their courage. This is a memoir that I will not soon forget. The Man in the White Sharkskin Suit by Lucette Lagnado. The Ecco Press, New York. 2007. 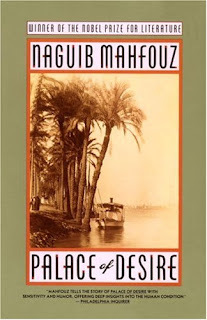 As I near the end of the third and final novel of Naguib Mahfouz's masterpiece I thought I would summarize a few impressions of my experience reading this magnificent work. 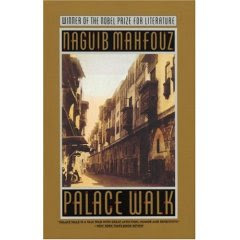 The first novel, Palace Walk, introduces the family of Ahmad Abd al-Jawad: his wife Amina, sons Yasin, Fahmy and Kamal, and daughters Khadija and Aisha. 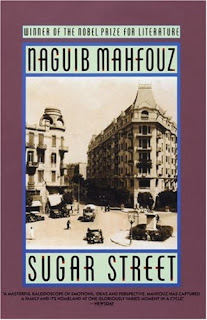 This family will be the center of all three novels as Mahfouz chronicles their experiences living within a Cairo neighborhood identified by the street, Palace Walk, home to the family. Prominent among the themes of the first novel is the freedom of the family (or lack of freedom) under the authoritarian rule of the father. Mahfouz slowly develops the relationships within the family and the novel builds upon events that epitomize the growth of each family member. Just as the middle son Fahmy excels in school he begins to seek freedom in the growth of nationalist fervor during the era of the Great War. Amina, who is present on the first page has the temerity to defy her husband and pays a price, yet demonstrates growth in stature within the family. Amina's life and personality is the lifeblood of the homelife of the family, bracketed by the scenes of the coffee hour and Amina on the roof overlooking the city. As the first novel ends we find the family's peace and structure threatened portending more change in the novels that follow. I am reading a book by Terry Eagleton, The Meaning of Life, that poses a lot of questions about that very issue. What is the meaning of life? Is it meaningful to even discuss this question? The book raises these and other questions and seems to alternate between challenging issues that encourage thoughtful responses, and a somewhat prosaic litany of differing responses to the questions, some of which do not deserve much thought or attention. What makes the book interesting and worth persevering are the former, the issues that challenge personal beliefs and encourage thoughtful meditation on the meaning of meaning, if not life itself. I was reminded of a somewhat tongue in cheek but lyrical meditation on the issue of meaning I wrote some years ago. ...alone with an inscrutable society. Explains not one iota of what you need to know. This play, written by Gore Vidal in 1968, is a witty and very humorous look at the nature of politics. "Ripped from the headlines," as they say, it was almost dead on arrival on Broadway in early 1968. However it stands up as a comic vision of a certain time in political history with somewhat prescient moments, including a sly reference to a break in at Democratic Party national headquarters that would actually occur four years later. What made the play interesting to the current audience was its' brilliant dialogue and the complexity of the theme of politics which was addressed at several levels. The machinations within the MacGruder family were just as convoluted as those at the national level of politics. The twists and turns made for an interesting and sometimes surprising evening of theater. TimeLine Theatre Company produced this rare gem as part of their new play reading series. The production was excellent. The readings of Terry Hamilton, Erik Hellman and Penny Slusher as Senator MacGruder, his son Beany and wife Louise, respectively, were outstanding. If this series continues with such excellent fare it will be a welcome addition to TimeLine's fine record of dramatic productions. I was reading the wonderful story Pigeon Feathers by John Updike this morning and the thought occurred to me that young David Kern's (the protagonist of the story) situation was not that different than the young Kamal in Mahfouz's Cairo Trilogy, especially in the second volume, Palace of Desire. Not surprisingly, both texts were written within in a decade of each other (Mahfouz in the early fifties and Updike at the beginning of the sixties - of the last century) and each have, in part, the theme of how a young man thinks about faith and issues of spirituality. In Updike there is a bit more emphasis on death, but the issue of faith and the loss, or moving beyond, it is central for both young men. In each the boys are well versed in their faith. Kamal has memorized much of the Qu'ran and David is attending bible lessons in Sunday School. But the knowledge of their respective beliefs seems in each to inspire a spiritual rebellion. One that is not asked for, but comes none the less. In David's case his very questions of his pastor seem to be irreverent, at least in his imagination. While we see Kamal battling within his own mind, his inner dialogues questioning the nature of the world and spirit. It is striking that in this century in cultures separated by thousands of miles, one in the heart of the United States and the other in northeastern Africa, that these two young men are portrayed as facing similar spiritual issues and each in his own way moves in the opposite direction. David, in his experience with the barn pigeons, sees his faith in the eternal strengthened while Kamal moves toward a study of philosophy that seems to lead to a rejection of his faith. I have begun to read the novels of Doris Lessing who was awarded the 2007 Nobel Prize for Literature. I have started with an unusual choice, reading Shikasta , the first volume of her series Canopus in Argos. Having read many science fiction novels over the years I was not prepared for this unique approach to the genre. Lessings' space novel is told from the point of view of the alien Canopeans who compete with their rivals from the planet Shammat for the guidance of civilization on Shikasta (Earth). A cosmic accident of some kind (not caused by Shammat) disrupts the energy flows between Shikasta and Canopus. This leads to the breakdown of the harmony of Shikastan civilization, and dominance by Shammat. As an immediate effect, the life span of living beings on Shikasta is shortened from several hundred years to the average life span of a contemporary human. All kinds of evil aspects of modern society (mostly that of political violence and abuse of power) start to arise from this energy disruption. Throughout the Canopeans have agents visiting Shikasta to report on the events and finally living as Shikastans . The novel uses many different styles including historical reports, sociological studies, memos and the diary of the sister of the protagonist, George Sherban (aka Johor). It is a fascinating display of imagination even though it is dated in some ways (the Soviet Union and Communist China are depicted as they existed thirty years ago). It is almost quaint the way Johor walks across Africa and letters from Communist China are sent but never received, while the level of technology presented does not incorporate the immense changes in computing. However, as an allegory it demonstrates an political world that is not too different from the one in which we live. Overall I enjoyed her writing style and look forward to my next Lessing work, her first novel The Grass is Singing.